We don’t skimp on essential prenatal nutrients like brain-boosting choline1, DHA, fatigue-fighting iron2 and protective folate, all in hygienic, convenient daily packs. Better ingredients make better vitamins; that’s why we use chelated minerals3 (no nausea), methylated B12 and full spectrum vitamin E4, just for starters. Pregnancy is a special and delicate time. We pick only gentle and pure ingredients like natural vitamin A5 and DHA made from algae, not fish. Poly C, Massaro JM, Seshadri S, Wolf PA, Cho E, Krall E, Jacques PF, Au R. The relation of dietary choline to cognitive performance and white-matter hyperintensity in the Framingham Offspring Cohort. Am J Clin Nutr. 2011 Dec;94(6):1584-91. Patterson AJ, Brown WJ, Powers JR, Roberts DC. Iron deficiency, general health and fatigue: results from the Australian Longitudinal Study on Women's Health. Qual Life Res. 2000;9(5):491-7. H. DeWayne Ashmead, Comparative Intestinal Absorption and Subsequent Metabolism of Metal Amino Acid Chelates and Inorganic Metal Salts. Biological Trace Element Research. Chapter 24, pp 306– 319. Naguib Y, Hari SP, Passwater R Jr, Huang D. Antioxidant activities of natural vitamin E formulations. J Nutr Sci Vitaminol (Tokyo). 2003 Aug;49(4):217-20. Strobel M, Tinz J, Biesalski HK. 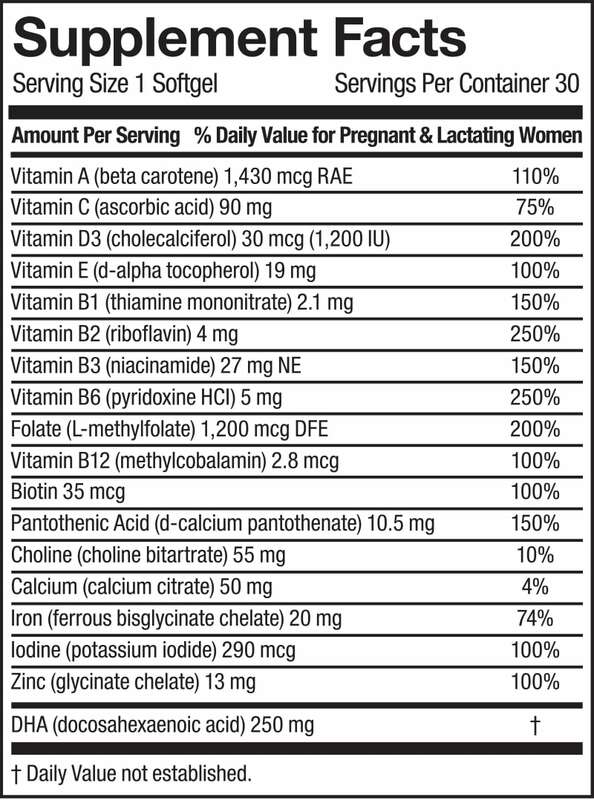 The importance of beta-carotene as a source of vitamin A with special regard to pregnant and breastfeeding women. Eur J Nutr. 2007 Jul;46 Suppl 1:I1-20.